Caleb had a very productive day of learning. We were supposed to focus on the letter A and number 1, but he knows those pretty well. We did a coloring page of the letter A, and talked about “one crayon at a time,” but then we moved on to something way more fun, because I kept looking out the window and seeing the beautiful colors of Maine in fall. I took him outside to go learn about, and pick, leaves. We talked about how they start on trees, and then fall to the ground as it gets cold. Then I showed him all the colors they come in. I asked him to pick a bunch for our craft. I wanted to grab some of the incredibly beautiful and bright leaves… but I’m short. So we ended up with some cool gradient leaves instead. Orange and yellow, green and yellow, and red and yellow are what we ended up with. Before we went I cut up a sheet of green, yellow, red, and orange construction paper, then when we got home I showed him the papers and how they matched the leaves we collected. Next it was time to talk about patterns and practice our color recognition while building a cool autumn leaves paper chain. I had him hand me ONE green, one yellow, one orange, one red, etc, etc, until all the papers were gone. He would hand them to me sometimes, and other times he would slide it through the last chain. 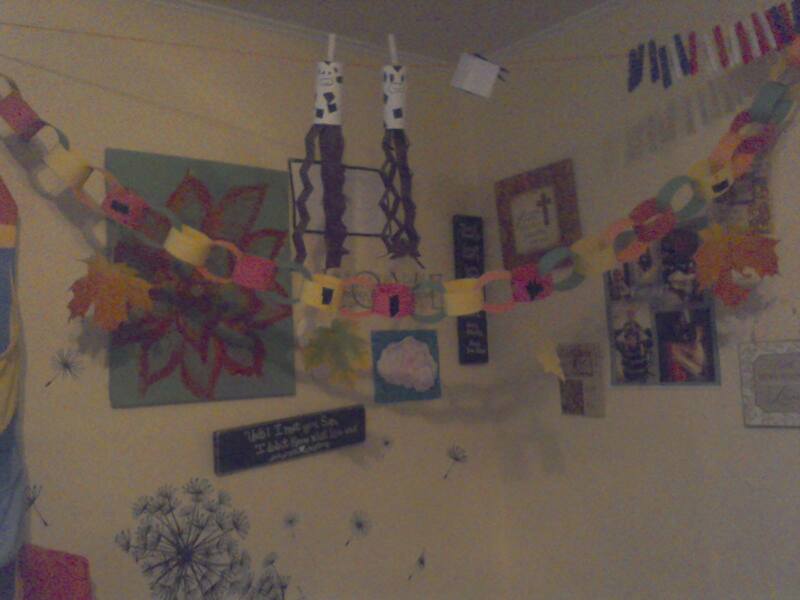 We clothes pinned it up, and Caleb chose which chains would have leaves hanging from them. So much fun! Even though this wasn’t originally on the curriculum, figuring it’s cow week not seasons week, I decided I couldn’t pass the chance up. We still got to talk about green (the color of the week), read a few books, and the fine and gross motor skills used to identify and say colors, as well as threading the paper through the previous chain, was a great practice, and covered what was planned. Oh, and while we were reading I pointed to a piece of broccoli. I asked Caleb what it was, because he loves broccoli and can say the word, but instead of identifying it he said, “Green.” I was really pleased. It was a fun day of learning for the both of us, and really nice to bring nature into our learning.